Ouch. Well, I've spent $30 on worse things, even if I can't think of any right this moment. Firstly, let me explain why I bought this book. I was in a town we visit maybe twice a year, and I always go to the book store there. I was taken aback by the price, and put this one back on the shelf twice. In the end, I knew I would regret not buying this book because I hadn't seen it before, plus the dog on the front was cute. And the quote on the front seemed to drag me in 'How on earth did this happen? How did it come about that I was spending my days adjudicating between two dogs who were acting out the story of my life?' the blurb in the front covers claims the author finds the way to her heart (although I did not read the blurb until I was finished, I don't like spoiling books for myself)So she first gets Stanley, then Sophie and claims they are going to be the light in her life. She's lost her husband after a long illness, and I can understand the depression, the inability to move on. I just will never understand the giving up of the dogs, or rather the need to write about the fact that you couldn't look after two animals you had agreed to take in and love. Maybe this time I should have spoiled myself, because I did not want to read that. My facebook feed is full of abandoned animals, pets that didn't fit into someone's life. There were backup owners in this case, but still, urgh.The author is a writer by trade, but the cramped paragraphs and over the top descriptions didn't do much for me. There was far too much human and not enough dog for me in a book that has been compared to Marley and Me. Not my cup of tea at all. This book was infused with unnecessary anecdotage and the author's smug and superfluous ravings about how wonderful her two dogs were - despite the fact she gives them away at the drop of a hat (and we were expected to mourn with her?). 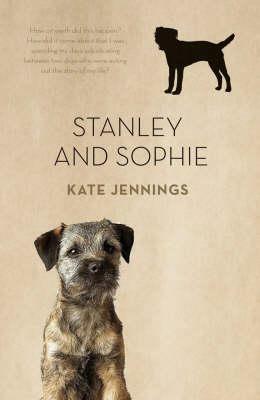 Had Jennings been even slightly more down to earth about her two strays, I may have empathised with her on some counts, however she clearly used her standing in the literary world as a selfish excuse to wax idiotic about animals which were only a part of her life for a few years at most. Yes, we all have significant seasons, however Jennings' experience with her pets clearly didn't leave the mark on her she herself believes it did - it is evident in her own writing, if she would only do us the favour of reviewing it before publication. I recommend Jennings take up a blog, and cease her infiltration of the published world with her meaningless and hardly profound tracts. This wasn't at all what I expected. Maybe I'm just not a memoir kind of person but I was after a happy story about the life of the author with her two dogs. Instead I got a story about a person who couldn't cope with her two pets and gave them away on a whim so she could go travelling around the world instead. All I kept thinking through the whole book was 'Stop complaining about giving the dogs away. You shouldn't have done it in the first place! 'Plus another thought constanly kept coming to mind 'Have you never heard of obedience training or making some other type of effort to fix the behaviour of a dog rather than just giving them away? 'All in all I don't really have much that's positive to say about this book unfortunately. It just frustrated me to no end and I was always left feeling that there just should have been a bit more to it.If you're after a story of a person dropping everything in life to try and find herself, then this is a story you might like. As much as I love animals I probably shouldn't allow myself to read books like this where pet ownership is explained from other points of view. My pets are like fur children to me who I have committed to owning, therefore have committed to the good and bad times that come with that. I just get too angry when I see instances where other's don't feel anywhere near the same. I picked this up because I'm a Border Terrier owner and they're still relatively uncommon where I live. The author is an Australian who lives in NYC and got first one and then another Border after the death of her husband. I don't think this book would ever have been published if the author wasn't already published and working with an agent. Although some of her insights are interesting and she draws from a wide array of sources, the book seems sort of hobbled together. And, weirdly, I didn't feel like she was really describing Borders. I've owned two so far and known others and hers seemed more neurotic than others I've known. This book was about life with two border terriers in a city environment. I enjoyed the book because I could relate in so many ways, all the walks, two dogs constantly harassing each other, etc. I loved all the quotations she included from other authors and dog lovers.I didn't understand where the middle section fit in with the beginning or the end, but it was still interesting. I learned that you don't necessarily have to find love in a person; it can come from the place you least expect it- your two best friends. I could never give up my pets as she did. It may be the best decision for them but I just couldnt do it. Not what I expected...SPOILER ALERT...she gives one of the dogs away, tough to read, weeper. Very self-absorbed writer, but the dogs are incredible, as all dogs are. loved the dogs, felt a connection with them...the author, not so much. I am still not convinced that the life of a "city dog" living in an apartment is a very happy one. What a wonderful book! A quick and easy read which tells of the love of a lady for her dogs. A love that saw the ultimate sacrifice. Not at all what I expected. It was almost a Eat, Pray, Love wannabe but with some very disturbing parts. I selected this book because of the Border connection. I discovered it was more like Eat, Love, Pray. Kate Jennings - Kate Jennings is a poet, essayist, short-story writer and novelist. Both her novels, Snake and Moral Hazard, were New York Times Notable Books of the Year. She has won the ALS Gold Medal, the Christina Stead Prize for Fiction and the Adelaide Festival fiction prize. Born in rural New South Wales, she has lived in New York since 1979.Her most recent books are Stanley and Sophie, Quarterly Essay 32: American Revolution and Trouble: Evolution of a Radical.